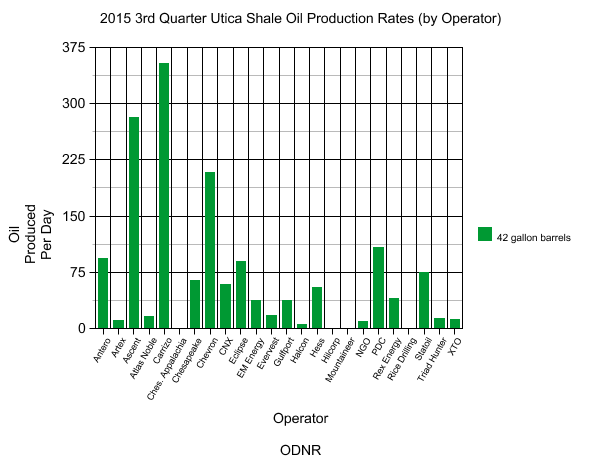 The Ohio Department of Natural Resources has now released the production data from the Utica shale for the third quarter of 2015. As always, we are going to give you a look at how the numbers compare to past quarters, past years, and how they break down among the various drillers who are active in Ohio and the counties where they are drilling. We also have the top 10 oil and gas wells detailed below. The figures show the effects of the slowing in activity as a result of the downturn in oil and gas prices, with growth slowing and production rates beginning to come down. As the numbers show, between the second and third quarters of 2015 oil production rates have slowed by nearly 500 barrels per well and about 1 barrel per day in production. Gas numbers climbed in terms of gas produced per day in production, but fell in terms of gas produced per well. 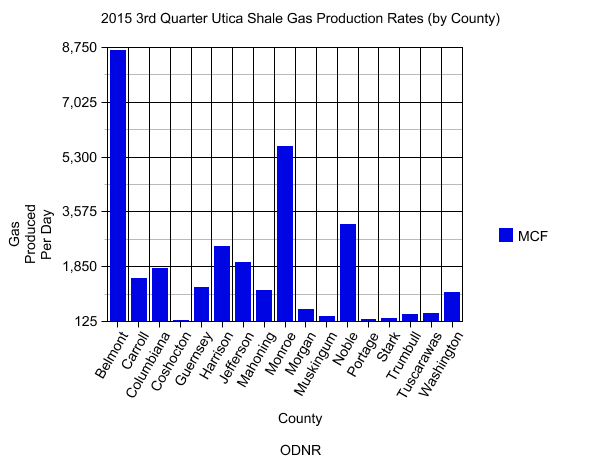 Despite the slowing growth, there has still been more Utica shale oil and gas production in the first three quarters of 2015 than there was in 2011 to 2014 combined. 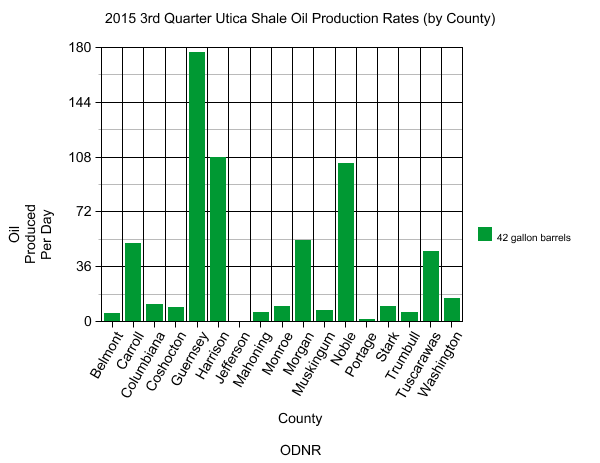 Guernsey County featured 9 of the top 10 oil wells in the first quarter of 2015, and then had 8 of the top 10 in the second quarter. It is down to having 6 of the top 10 best producing oil wells on this latest report. The Bauer 14-14-6 8H well is the lone well from Carroll County to crack the top 10 for the second quarter in a row. For the second straight quarter it's Rice Drilling and its wells in Belmont County that dominate the top 10 gas producing wells. The Bigfoot 9H, Blue Thunder 10H, and Blue Thunder 12H wells have all now been in the top 10 gas wells in each of the first three quarters of 2015. 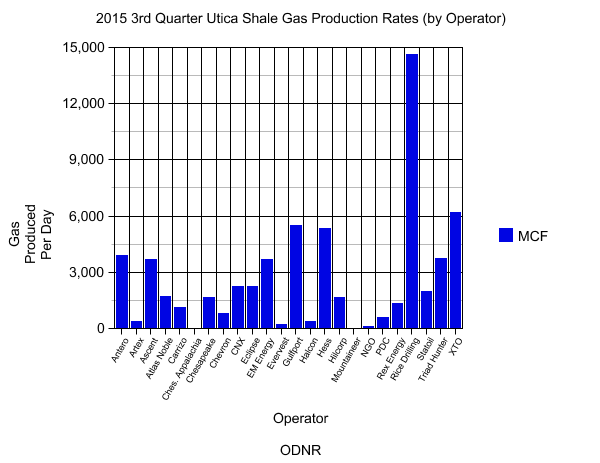 Ascent Resources (formerly known as American Energy Utica) had the top 5 oil producing wells of quarter two, but this is the first time they have had wells that ranked among the top 10 gas producers in a quarter. You can download the spreadsheet containing all production data for the third quarter by clicking right here.